Onesimus Matsiko is the General Manager for Growers at IGTF, located in Uganda’s mountainous south-western region of Butare, near the town of Ishaka. In 2017, Matsiko – along with IGTF’s plantation foreman, Jackson Byaruhanga, and IT Manager, Hamlus Owoyesiga – forged a business plan for implementing technology to boost productivity and support farmers. Matsiko was first introduced to drone technology used in crop cultivation in October 2016, at the 2nd Pan African Agribusiness Incubators Conference and Expo in Accra, Ghana. Sponsored by CTA to attend the conference, Matsiko said that the technology he saw was impressive, and that these devices could lead to more sustainable and innovative agricultural methods. It was new territory. "We started by asking what can drones do for us. Now that we are using them regularly, we have started asking what do we want drones to do for us?”, he says, emphasising a shift towards needs-targeted use. Drones are used in CTA’s Eyes in the Sky project to provide a crop inventory (e.g. crop count and yield estimations) and crop management advice, which help farmers to calculate yields, as well as their fertiliser and seed requirements. The project has also successfully created digitalised profiles of over 4,000 smallholder farmers, which map the location, size and productivity of their farms. With the combined data provided by the drones and farmer profiles, it is “easier now for farmers to receive fertiliser and credit, not just from us but also from banks, because the information that is recorded can act as collateral,” says Matsiko. 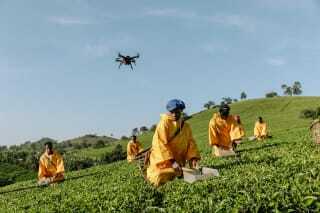 Unmanned aerial systems (UAS) technology has become part of the profiling process to help gather additional information that is relevant for the farmers’ digitalised data file. Pointing at a distant ridge, Matsiko says, “I can see that hill over there and I know that its yield will be a meagre 30%. What I can't see is the hill behind it, though. Or the one further down. Without the use of drones, there is no way for me to know what the farmers need or what their yield will be if I don’t walk over there myself." The plantation is over 6,000 ha. 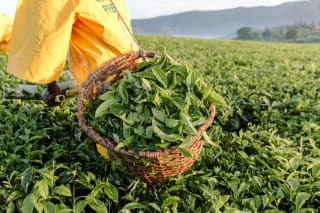 The decent employment opportunities for highly skilled labour in UAS management encourage and attract youth to work in the region’s tea industry – an occupational sphere often rejected as old-fashioned by young people entering the work force, or looking for modern opportunities. "It is the difference between going to school on a motorcycle with a cell phone, or going by foot, dragging an old backpack. The young people entering the workforce don't want to step into their elders’ shoes, they want shoes that fit their feet so they can walk forward," says foreman Byaruhanga.